Lots of toys these days give some form of response that’s intended to be positive reinforcement for the play experience. For instance, the toy lights up or makes sounds when kids get the answer correct, or the toy makes an animal noise when they put the right piece in the puzzle. It’s been proven over and over that kids feed on this. They do better when someone praises them. Plain and simple. Where I see kids losing the continued learning in a toy that offers positive reinforcement, is that often, the praise and reinforcement stops when the toy falls silent. Thus the kids stop going to those toys and the power of the reinforcement of the particular skill is minimized due to the repetition of the toy’s responses. How can we make sure certain learning toys are used more often and the skills are being developed and/or reinforced by the child? It’s a surprisingly simple answer. Parents need to be engaged in the praise and reinforcement process. We can’t leave it up to the toy to do this. Kids seek approval from their parents 24/7. 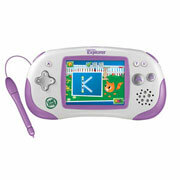 I know my kids do far better with their Leapster Explorer games when I tell them a simple “good job” or give a high five when they’ve conquered a level or successfully answered a question they were struggling with. Had I not, my son would have simply said “too hard” and tossed it aside, or perhaps “that was too easy” and done the same. Positive reinforcement from parents can be anything from a pat on the back or smile, to a high five or verbal praise. It doesn’t have to be anything in depth. I also often ask the boys when they are playing their various games how to do that level. Their showing me makes them feel like they are so smart, even their “dumb ol’ mom” can’t figure it out. With the toddler, my questions are obviously less involved, but I ask things when he’s putting together a talking animal puzzle, “What does the cow say?” and “Where is the red barn?” By taking a greater interest in your child’s “learning toys” they will have a bigger interest and ultimately learn more from them. Parents can change their responses based on how their child is engaging with the toy, and in response to whatever is going on in the moment. If a child is frustrated, for example, you can encourage them to keep trying, or allow them to express their frustration, rather than a mechanized voice saying “Try again.” If it would frustrate or annoy an adult, you can bet it does the same for a child. Toys are great for engaging kids, but there’s no machine that can replace the attention and investment of a caring parent. How do you interact with your children when they’re playing?